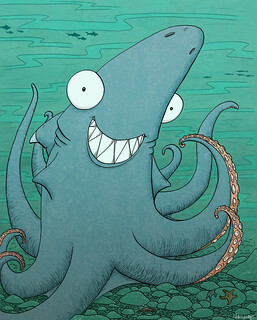 Genetically engineered, a monster that is half-shark and half-octopus goes on a killing spree. “Why can’t it ever the good halves of things? Why can’t it have a big smile and wave to eight people at once?”, she asked. After thinking about it a bit more she, rather sadly, commented on how the outcome would probably be the same with people killing it out of fear when it tried to hug them. 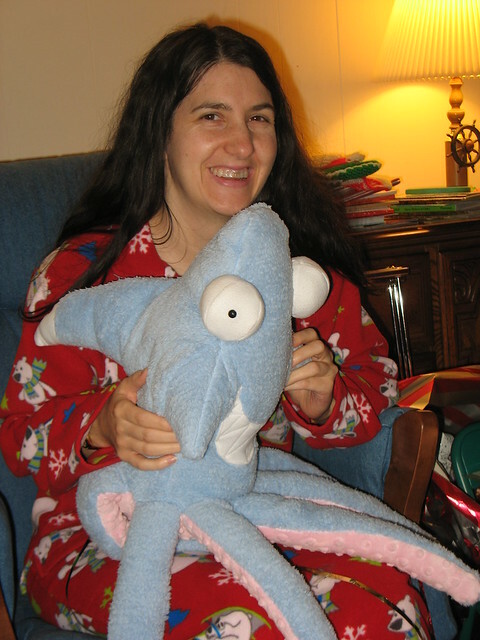 The next morning I woke up and found I couldn’t shake the image of a happy, friendly sharktopus, smiling and waving. My thoughts immediately went to Natalie Metzger. I though she might also find the idea humorous, and as we already have some of her art and photography hanging in the house I figured I’d see if she would be willing to take a commission based on the idea. Natalie responded positively, and send along her (very reasonable) price sheet. I looked it over, and my brain exploded. There at the end of the list was “(~1ft.x1ft) stuffed animal”. Stuffed animal! How awesome would that be? I asked if an 8×10″ and stuffed animal could be done in time for Christmas. About a week later I received a sketch. It was better than I imagined. Perfect. Well,almost. It only had one tooth, which gave it an amazingly cute smile, but knowing Denise I was pretty sure she envisioned it having a very toothy shark grin. I managed to bring it up again in conversation and confirm my suspicions without awakening hers. I let Natalie know and she quickly made the change. The stuffed animal took a little longer, but when I saw the photos Natalie sent I knew Christmas couldn’t come soon enough. Luckily the box came on a day when I was working from home and alone in the house. I opened it, took a quick peek at the awesomeness it contained, then packed it back up and hid it just as I heard the garage door opening. I wrapped the print, and the stuffed animal separately and made sure Christmas morning that these two particular presents were the last left under the tree. I gave Denise the print to open first, and she understood at once what it was (and even recognized the artist on the spot). I could see she was pleased. When I handed her the big giant box she had a bit of a “how are you going to top that one, and what in the world is this giant thing?” look on her face. This entry was posted on Thursday, January 6th, 2011 at 10:00 am	and is filed under Wife. You can follow any responses to this entry through the RSS 2.0 feed. Both comments and pings are currently closed. I am in shock at this awesomeness! I mean, I always knew you were awesome, but this is the coolest present ever! Glad you approve. Now I have to start thinking about what to get for her birthday. This is a serious “what to get someone who has everything” kind of gift! :-P But seriously, it’s pretty incredible. Way to listen to your wife and totally surprise her. :) Thank you for sharing this story, and a happy new year to you both. Hi Cindy! Good to hear from you. Happy new year to you and your family as well.